I´m racing a CR750 since a couple of years and I don´t know exactly what type it is. Can anybody help at identification of the frame? the fork? does anybody know what type of rotors it has? did you solve your catch tank problem? Looks the biz. What rim size wheels? Love those. Brent you should show Curtis those frame pics, might have an idea..
aaa before I forget it? Any ideas about the fork? Tail piece is Rickman and the forks look like early Rickman CR as well. Such a cool bike. Do you have specs on the engine? Rickman just built forks with one dics!? or I´m wrong? Engine is 900cc bigbore. Head is F2. Cams are - I believe- standard. There were definitely twin disc versions of the later 38mm forks and thought there were twin disc of the earlier ones like you have but not 100% sure. The Rickman forks were made by Betor.. I think on the 41nm most were single disc. I remember one on a Norton Rickman here around 1972. Had that big cage thing around the rotor with really short spokes on that side..
the betor forks only went up to 40mm at that time , i think they are more likely to be ceriani . The set of 41,s I saw was back in 72. .. with the weird hub..
First one came out in 1966.. this is what I saw. . The fork looked massive in I'm the only thing that big was probably on an Electraguide, andvtheyvwete covered up. The image stuck with me and I always wanted onem I do now have a set of triple trees, mated with 41mm SV forks, but then I found out the Rickman is actually 1 5/8 like Harley... curses. so you think that its a "rare" 2 disc 41mm Rickman fork? It looks like 41 mm,Tim can you mike the stanchions ? "And here, poor fool, I stand once more, // No wiser than I was before." That is a very nice machine! Frank, that outer cone for the 41mm Rickman CB front brake is being quality produced in Poland today. I considered getting one when I still had a Rickman-Honda since the stock front rotor looks so wimpy. The frame is most certainly not a Rickman. 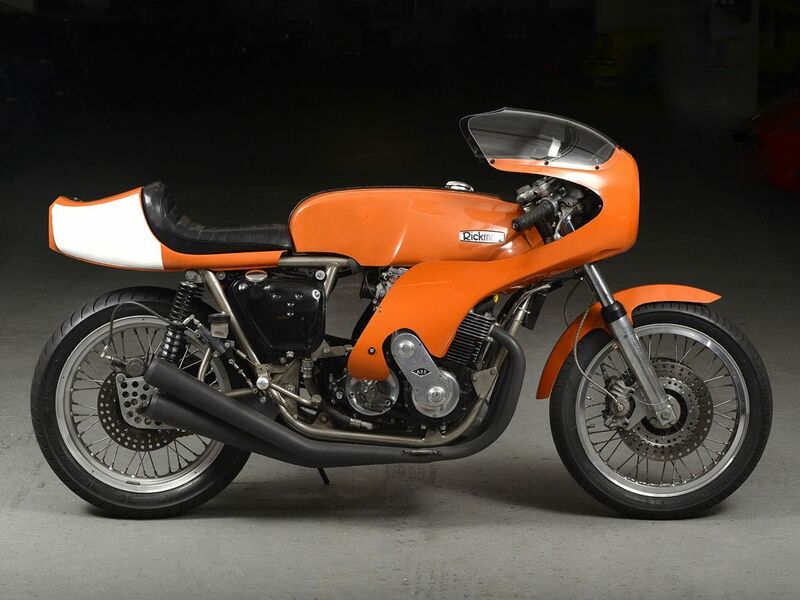 Given the backbone oil tank, my vote would be for an Egli lookalike or a PFM. Also note the oval steel swingarm. That certainly points to an Egli-like frame with rear non-concentric adjusters. There were rumored to be a few sets of 41mm Rickman race forks with dual disks, but in my thirty years of working with my Rickmans I have not been able to verify the rumor and I've inquired worldwide. In looking at the forks on this bike, I'm inclined to call them Cerianis but the triple tree is more like a Rickman CR or a Marzocchi. To my knowledge and research, the only 41mm Rickman forks were single disk and the rotors were nothing like the machined rotors on this bike. The CR dual disk forks were, of course, 38mm and made by Betor. The Rickman 41mm forks were made by a company with a somewhat generic name like "Continental Fork Company" but I just don't remember the actual name. If I can provide any additional info, please just ask. I'm no guru but I do have some experience with the Rickman CR. many thx for your post. I never heard of PFM frames. I also cant find anything about them. Do you maybe have a pic? I´ve had a look on hundreds of cerianis but they all has a different cast form. They are much "rounder". sama at the marzochis. When I google rickman CR forks, there are several which look pretty close. But most of them just have one disc. So... frame and fork are still a bit of a mistery for me. Unfortunately I have no pics of frames due to a catastrophic hard disk failure on my primary computer. But I believe you already have your answer with Egli employee. That's all I can give you at this time. Ride well! Many thx for the links. Bove is similar but not same! Its an original rickman bike- with same 41mm forks. Just the discs are bigger. Even tripple tree is 100% same. So what do you think about that. A Guy on facebook told me that just 5 of these forks had been built. Can that be true? Do you mean 5 dual disc .. In that pic the visible caliper mount looks to me welded on ie added on. The cast in mount is quite distinctive. I have see more than 5 41mm forks mostly in pics, and I scored a NOS set of trees with the cb 750 stem.. The mount in the leg in the photo is definitely welded on, not cast. Is the cast caliper mount on the '41' leg centred? Is it possible to just put one on the right, and mount the caliper on the opposite side the the mount?? no, its not centered, so its not possible to swep them. And its not wlded on. So I´m still a bit clueless. Is it possible that nobody on this planet has informations about rickman forks?